The Nighthawk is a very popular general purpose fishing kite especially in areas with predominantly light winds such as New Zealands east coast. 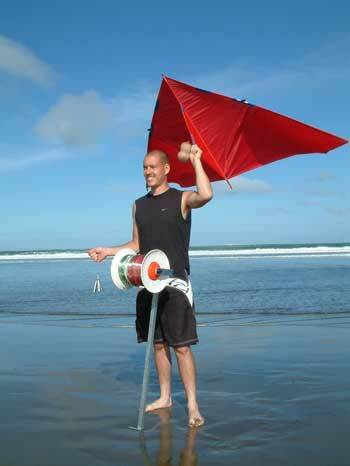 This kite is particularly popular in the Bay of Plenty. The Nighthawk Delta kite is constructed from top quality sailcloth and fitted with a carbon fibre centre spar and fibreglass wing spars. It has a wooden cross spar for safety. 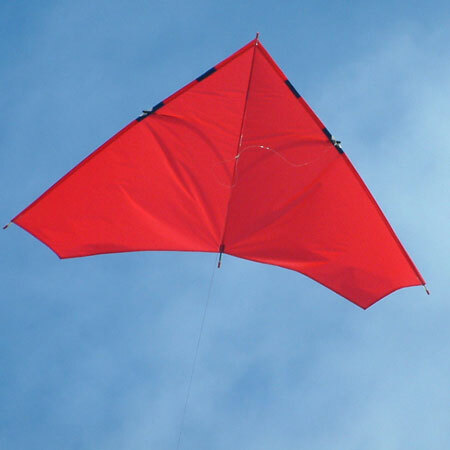 This kite is excellent in light to fresh wind conditions. The Nighthawk is designed to fish rigs with 65 to 100 kg breaking strain mainlines. This is undoubtedly the best kite for general purpose fishing in New Zealand because it combines good tacking ability with a wide wind range. Even novice kitefishers can usually get a set straight out if the wind is more than 40 degrees offshore. Experts using a skyhook with this kite can often fish with the wind blowing straight up or down the beach or at any offshore angle. If you are only going to have one kite and you don't fish the Wairarapa, or the east coast of the South Island, then this is the one to get. In you are in the above areas we suggest a Super Kite is a better option. The Nighthawk kite is very stable and a great performer. The Nighthawk Delta in the picture on the left is shown with a 100kg - 1800 metre longline reel. If you are using just this kite, around 10 knots or more of wind is enough to tow the gear out to the full distance offshore on the east coast. This kite is often used with a Skyhook sail kite beneath it to increase power when the winds are very light, the surf is high, or if the longshore current is strong. If you intend to do a lot of your kitefishing on the west coast, Paul recommends using a Nighthawk kite on a 65kg dropper rig for most conditions. A Skyhook kite sail or a second Delta kite is also recommended for those who wish to fish the trickiest conditions on the west coast. Note : Longline reel and mainline not included.